Details emerged on Saturday on how 19 members of a vigilance group died and 38 others seriously injured in a crash along Daudawa-Funtua road in Funtua Local Government Area of Katsina State, on Friday. Members of the vigilance group from Rafi Local Government, Niger State, reportedly embarked on the journey to obtain ‘bulletproof’ charm from a boy in Tsaunni village in Tsafe Local Government Area of Zamfara State. 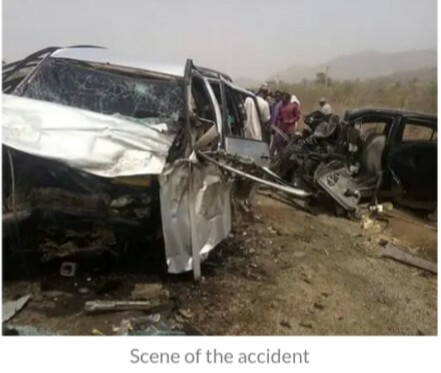 A survivor of the tragedy, Buhari Usman, who spoke to newsmen on Saturday, claimed the accident occurred while the victims were returning from Tsauni village. According to him, they went to the village following information that a boy was in possession of a potent charm against bullets. “We were told his charm is good. People have used the charm and they claimed it has worked for them. He said it was when they were coming back that the accident occurred when the driver of the vehicle dozed off and they suddenly found themselves inside a big ditch. The Federal Road Safety Corps (FRSC) confirmed the death of 19 persons, while 38 persons others were injured in the accident along Daudawa-Funtua road,on Friday morning. But I don’t understand 38 injured and 19 dead, were they traveling in a trailer or truck? Powerless gods/charm. d devil doesn't give you anything for free. Funtua is kaduna not kastina. Good for them, in the process of preventing bullet the could have asked for accident proof too. Juju no dey pay. Wrong. Funtua is in Katsina State. I too know. Funtua is in katsina state. Check your facts before proving what do don’t know. There might be another Funtua in Katsina. Same way there are sabon gari and tudun wada and many northern states. Sigh, if only they trusted in God and wait on him. May their souls find eternal rest and quick recovery to the injured. Their sorrows shall be multiplied that hasten after another God. Any small thing you ll blow bible verse. What if they are traditional worshippers. The other year 19 ppl who traveled for holy ghost congress died in a motor accident, what would you call that. Take this religious supremacy easy. Say RIP to the dead and keep it going. They just signed their deaths in the medium the went to. Satan has destroyed 19 souls. The remaining ones aren't safe unless they run into the Christ Jesus the savior and be saved. A country that is working would not need vigilante groups. we should all start from there. It is well,RIP to the dead,Quick recovery to the injured.